Just recently the hubby and I had a chance for a little “date day” together. We decided to walk around on Magazine Street in Uptown New Orleans where he grew up. Since it was only about 10am and nothing around there opens until 11am we decided to get us something to eat at a newer place (2-3 months new) called SmashBurger. 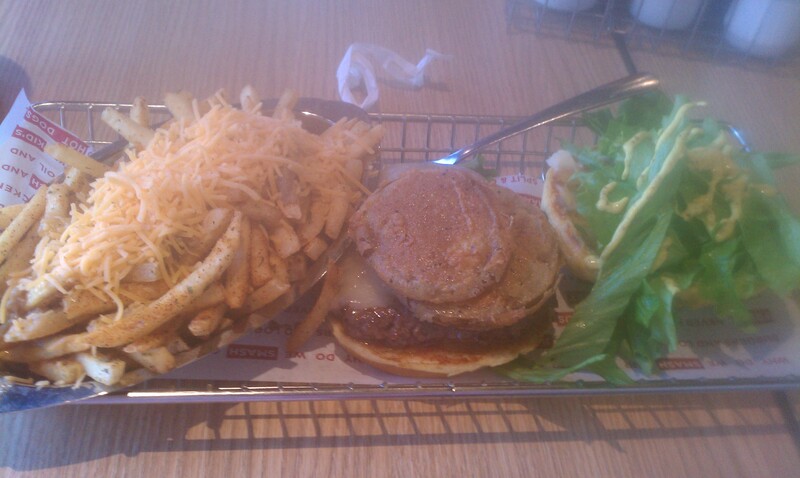 At SmashBurger they offer quick meals such as burgers and fries in a variety of options at a nice and reasonable cost. This was our first time in there and we were the first customers of the day. We were greeted with a smile by the sweet lady at the counter, I believe her name was Ronyca. She had a bright smile and happy attitude. I ordered some fries off the menu called debris fries and a NOLA style burger. For those unfamiliar “NOLA” is a common term used in New Orleans which is actually a short word meaning New Orleans, LA. The NOLA Burger consists of creole mustard sauce, shredded leaf lettuce, fried green tomato, mayo, and Swiss cheese on egg bun. The debris fries are Cajun fries topped with roast beef debris gravy with grated cheddar cheese. The hubby had a plain burger so we’re going to skip his thoughts! Each item on the menu can be changes as necessary though if you want something extra or removed – hence the build your own burger option! Within 5 minutes, if even that long, the food was all ready and brought out to our table. For my drink I decided to try something from their tea bar which offers 3 teas: Passion Fruit, Unsweetened tea and Sweet Tea. I went ahead and tried the passion fruit this go round, which by the way is unlimited drinks while you’re there visiting!Â The passion fruit tasted pretty good. It was a little sweet, but barely – it was just right for the flavor. As far as my food goes I have never had the burger and fries in this manner so this is definitely different from other foods I ate in that category. The burger was unique and filling. It was also about $4-$5, well worth it and very cheap compared to other restaurants in the area! I loved the flavors and everything. I had the same experience with the fries. What I loved was unlike most places who like to use the fat fries or fat crinkled fries, they use the skinny ones. The seasoning and the gravy combined is making my mouth water as I write this up! Both dishes were HOT and FRESH and guess what? No hair added! I have to joke around with that because it seems like a lot of places people seriously like to lose their hair in your food so that’s a plus when you don’t find it! OnceÂ we finished our meal we just hung out a bit and took our time, waiting for places to open and such. It was nice not being rushed to get out upon being finished. The staff was very attendant and picked up the dishes off the table right away. They kept their distance, but checked on you from time to time – the way it should be. We weren’t hassled or nagged and we weren’t ignored. – how we like it. The next day we decided to have lunch their again this time bringing our daughter. We went during the lunch hour rush. We had a code to redeem for a “free smashfries” order for taking their survey. Since we were going to dinner with his parents that night we just wanted something small and light. He got his boring burger as I call it (which he thinks tastes great) and I got an order of fried pickles and debris fries for Sophia and I to share. We were going to get the extra order of fries, but the same girl who helped us the day before was there again and actually had given us the option to use what we were ordering as our side rather than getting the plain fries, which she didn’t have to do so we thought that was really awesome of her. Because it was lunch time and they were quite busy we expected a bit of a wait since that is typical during rush hour. Nope. We ended up having the same amount of wait time. Our food came quick and fresh. I did notice when the fries came out it was missing the seasoning from how it was the day before. The manager was out in the front actively helping with his staff and he quickly, no questions asked, fixed the problem. Very nice about it, no attitude or anything – double amazing! I mean we all know mistakes happen from time to time, but it’s how they’re handled that helps with the experience. The fried pickles I have to say are THE BEST that I have ever had. I’ve only had them from 2 other places, but this one has to top the list! Maybe it was a lucky day, I don’t know, but they were delicious! Sophia was enjoying the pickles and fries as well – she’s 4. We had a simple meal, but we all enjoyed it once again with the staff being just as active as when they were empty. We had a different guy checking up on our table, but going by the same courtesy or not harassing us. He simply would pick up our plates and make sure everything was okay and we appreciate that kind of service. In the end the family and I decided we absolutely LOVE SmashBurger and it’s one of our new favorite casual places to eat. Their price is perfect since we’re on an extremely tight budget. Their staff is friendly and helpful every time we go. The environment is clean, including the bathrooms! Most importantly their food is unique and delicious with something on the menu appropriate for everybody. 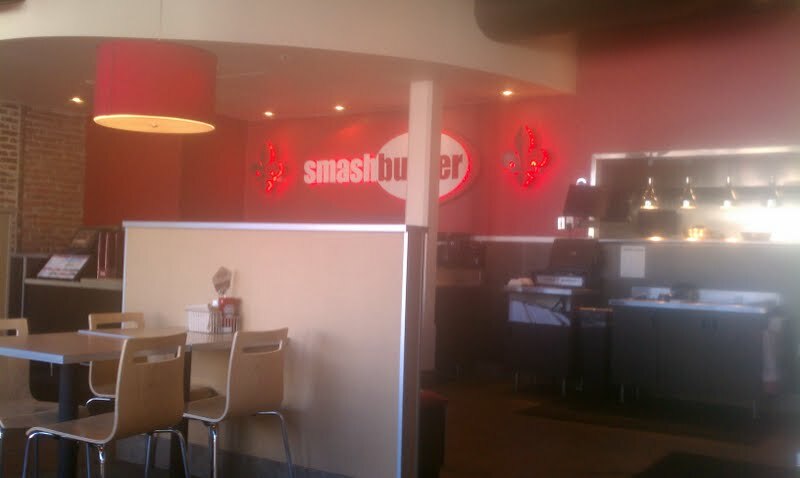 If you’re in the area head on over to Magazine Street and check out SmashBurger. They are AMAZING!